Asian markets were mixed on Tuesday with China’s CSI 300 losing 0.29% to 3,832 while Hong Kong and Australia lost 0.4% and 0.12% respectively. Japan was the centre of attention yesterday with both the Nikkei and Topix rallying an impressive 2% and 1.75% respectively. The Nikkei lifted above the 20,000 barrier to close at 20,299 for the first time in two years. This bodes well for the Fat Prophets Global Contrarian Fund where around one third of the portfolio is invested. We also hold a significant weighting in Japan in the Asian and Global Managed Account portfolio. I see this price action as being very bullish for the Nikkei, especially given Japan’s stock market has been so very resilient in the face of geopolitical, uncertainty with North Korea firing missiles and a stronger yen. Whilst a lot of commentary focused on the fact that North Korean tensions had eased and the Japanese yen had weakened. I see more fundamental positive changes in the economy as being the real driver as the “sun finally rises” on Japan’s economy which is breaking free from three decades of deflationary recession. The possibility of a snap election next month also helped the market yesterday, and removing political uncertainty would be a further boost to sentiment. One of the best-performing stocks on the Tokyo market was Nintendo, which jumped more than 7% on strong sales prospects for its Switch games console. Sony (which we hold) also had a strong day lifting 4%, whilst all the banks and financial stocks put in strong performances. This week’s price action on the Nikkei has been resoundingly bullish. 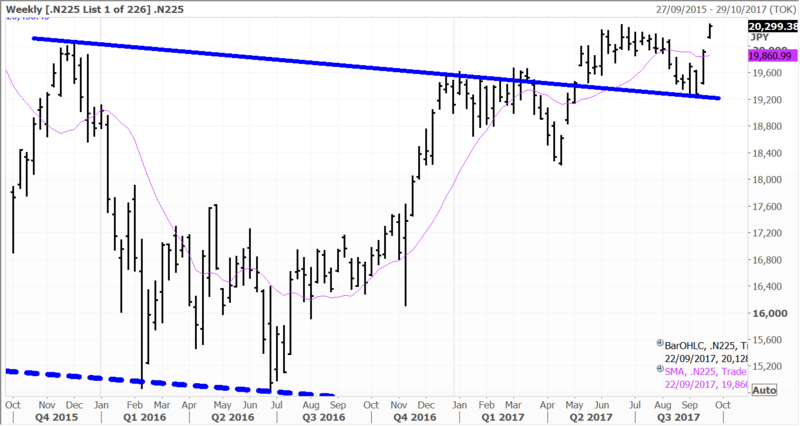 I expect the rally in the Nikkei to be sustained over the fourth quarter after overhead resistance was cleared this week. We could be in for one of the best quarterly performances for Japanese equities in some time. In Australia, the market ebbed and flowed on Tuesday to end the session 7 points down at 5713. The release of the RBA minutes was predictable in many ways, although not to the broader market it seems. Consumer discretionary stocks were sold off after the minutes highlighted the economic headwinds caused by high household debt levels and benign wage growth. We have been saying this for some time, and this is why we have stayed well clear of the retail sector which is facing significant structural headwinds. Interestingly, the RBA also stepped a little out of its remit and weighed into the debate on the all-important resources cycle, claiming that the iron ore market had ‘peaked.’ I am not so sure about the RBA’s view on the commodity cycle, particularly after the resource sector has endured one of the worst downturns in recent history. The central bank also went onto say that ‘solid growth in employment was expected to continue, which would support household incomes and thus spending. However, officials acknowledged the ‘risks to this scenario’ as ‘growth in housing debt having outpaced the slow growth in household incomes. I tend to agree, and have been saying that a strong employment market will inevitably feed through to higher wages, but the implication from the RBA is clear, and it is not getting carried away here with expecting this to feed through dramatically overnight. I think the other reason that the RBA will be very reticent about moving too quickly on rate tightening is the strength in the A$ versus the greenback. The bank noted that “The appreciation of the Australian dollar over recent months, driven in part by a broad depreciation of the US dollar, was weighing on domestic growth and contributing to subdued inflationary pressure. A further appreciation of the Australian dollar would be expected to result in a slower pick-up in growth and inflation.” The RBA won’t want to exacerbate this. On a related point the key driver for the key tourism sector is more the cross rate with the renminbi, yen and kiwi dollar. This morning the latest tourism inbound numbers revealed that Queensland had a record of 21.5 million visitors over the last year. This bodes very well for the tourism sector. Despite the fact that the A$ has been relatively strong in recent months, the tourism market appears unaffected. The latest tourism inbound numbers are going to underpin profitability at Mantra, which our analyst team have retained a Buy on. Mantra is also a significant holding in the Fat Prophets Global Contrarian Fund and in the Australian Managed Account Portfolios. I have been particularly encouraged by the latest price action in Mantra, following the solid profit result announced a few weeks ago. 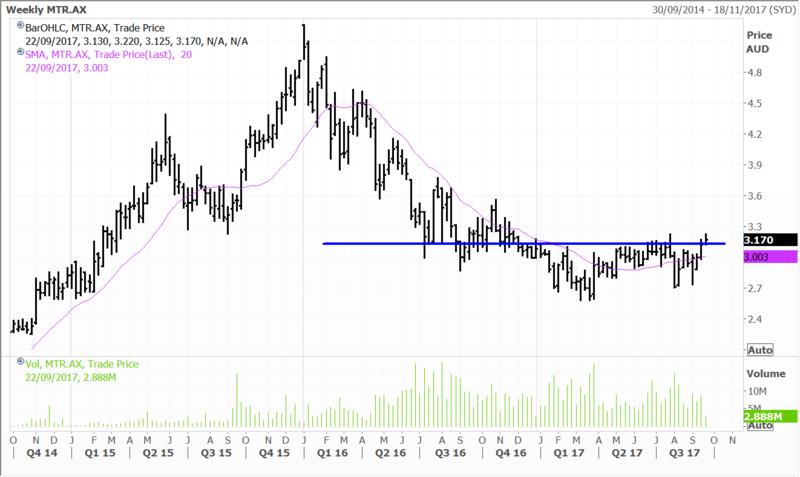 Mantra is in the last stage of clearing overhead resistance and staging a key reversal to the upside. With tourism inbound numbers continuing to expand into record territory, this should prove to be a powerful tailwind for the stock price. Tokyo-listed shares of Japanese robotics and automation specialist Fanuc surged 3.1% in trading yesterday, outpacing the index on a strong day for the Nikkei and taking the gain over the past week to 8% for Fanuc. A softer yen, a strong print for machinery orders in Japan and signs of a recovery in offshore markets have all boosted sentiment. We hold Fanuc in the Fat Prophets Global Contrarian Fund, along with in the Global Opportunities and Asian Managed Account Portfolios. Japan’s core private sector machinery orders rebounded in July, rising 8.0% month-on-month to surpass the average estimate of 4.2% growth. In June, orders dropped 1.9%. Overseas demand for Japanese machinery were up 9.1% and are a positive indicator for future exports. This bodes well for our exposures such as Fanuc, SMC Corp, Yaskawa Electric and THK. Longer term, we continue to view the prospects for leading automation and robotics players favourably. Benefits of automation and robotics include cost savings (especially as labour costs rise), faster speeds, quality stability, safety (i.e. reducing human exposure to high-risk work) and making things that cannot be processed manually, which is an increasing range of products. In the case of Japan, where the employment market is extremely tight robots are filling a void when company’s struggle to hire enough workers as well. Both the broader automation market and robotics are set to grow at a decent pace. Technavio Research estimated last year that the broader Global Industrial Automation Control market will grow at a compound annual growth rate (CAGR) of close to 8% from 2016 through 2020. This is a more mature market (where Fanuc is a leader via its Computerized Numerical Control (CNC) and servo motors). 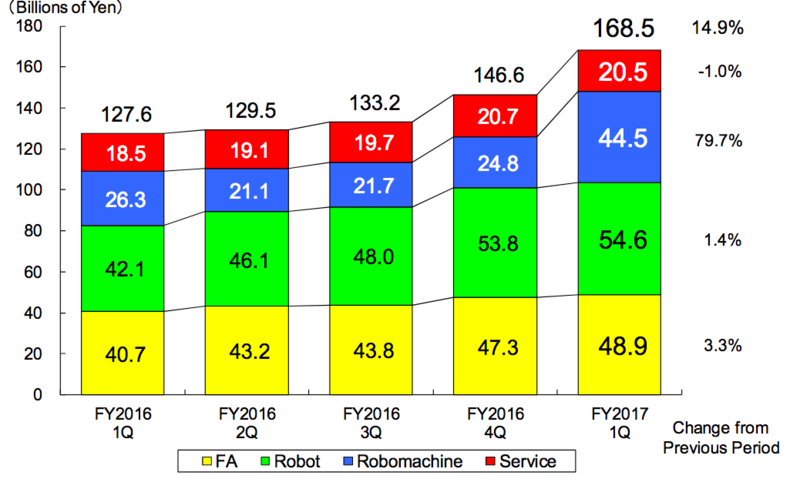 Industrial robotics demand (the area where Fanuc’s excels) is anticipated to be robust, with a 13% compound annual growth rate (CAGR) from 2017 to 2019. Fanuc currently has monthly robot production capacity of 5,000 units and this is set to expand to 7,000 by year end. The new plant (due to open August 2018) will initially add another 2,000 units of capacity, with a blueprint to add another 4,000 over time. Fanuc management expect the Chinese market to grow at above average rates for another 5-10 years, by which time the Indian market should be stepping into its shoes. Fanuc reported a solid set of fiscal first quarter numbers. For the three months ended 30 June, the company recorded sales of ¥168.5 billion, representing 32.1% year-on-year growth. The Robo-machine business (used in the smartphone industry) rebounded strongly, with sales of ¥44.5 billion compared to ¥26.5 billion in the year ago quarter. All other segments including factory automation and robotics all posted solid gains as well. By region, Asia was the bright spot. Although there was some modest compression in the operating margin, operating income still advanced 20.6% from a year ago to ¥50.5 billion and net income was up 35% to ¥40.8 billion. The company raised its half year and full year guidance, but even so we view the current guidance as conservative. Fanuc is known for issuing conservative guidance and we believe the company has done so again with very cautious foreign exchange assumptions. There is a distinct possibility of more upward earnings revisions from analysts over the course of calendar 2017. Disclosure: The Fat Prophets Global Contrarian Fund declares a holding in Sony, Mantra, Fanuc and SMC Corp.